Empire at Bellagio, a new, upscale apartment development in Bel Air, has opened to the public. The project, a development of Empire Property Group, consists of 23 luxury one-, two- and three-bedroom apartments with an average unit size of 1.3k sf. The LEED-Platinum green certified project is located at 11715 W. Bellagio Rd, north of Sunset Blvd on the east side of Sepulveda Blvd and the 405 Fwy. 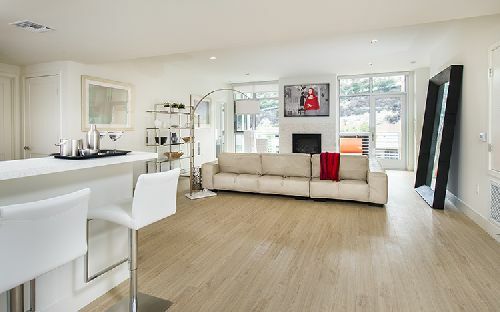 Each unit comes with a host of features, including large private balconies, high-ceilings and floor-to-ceiling windows offering stunning views of the Santa Monica Mountains. The contemporary kitchens and bathrooms have quartz countertops, imported stone tiles, stainless-steel appliances, Italian-designed custom cabinetry and designer plumbing and lighting fixtures. Other amenities include: high-tech in-unit security systems; a naturally-lit fitness room; a business lounge; and a 3k sf common roof deck separated into four unique outdoor living rooms. The deck features a landscaped lounging area with a tranquil fireplace and water-fountain, BBQ area, sun-bathing area, and a dog park with professional pet washing station. Empire assembled the three-parcel site in an off-market transaction during the summer of 2012 and commenced construction in the summer of 2013. The building is now complete and has recently officially started the lease-up phase. The complex is of Type-V construction comprised of a wood frame on top of a Type-I podium with a concrete subterranean parking garage consisting of 50 parking spaces. Marisa Zanuck of Nest Seekers, a leading brokerage sales and marketing firm in Beverly Hills, is handling leasing of the project. Rent for one-bedroom units start at $3,300/mo and rents for two-bedrooms start at $3,950/mo. This latest project follows Empire Property Group’s successful Empire at Kings complex, which was completed last year in West Hollywood. In addition, the company will break ground in early 2015 on a 23-unit, multi-residential project in the heart of Beverly Hills (Empire at Burton Way), and Empire is in the design and entitlement phase of a brand new 34-unit, multi-residential building in West Hollywood.